9 Year Old Comes Up With App Idea… Fooling Around During Homework. One of our kids (grade 4, age 9) and his little brother (grade 2, age 7) were doing math worksheets together. And as usual, they weren’t overly interested in doing math questions. The little brother would write down the answers and check with the 9 year old whether they were correct or not. His little brother laughed and then promptly answered the next question. The 9 year old squeezed out another little fart. That made both of them laugh hard and they both became more interested in what they were doing. 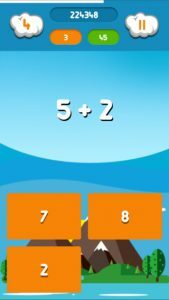 Check out Yucky Math in the App Store today! But with dad having no programming skills, he quickly turned to his good friend, an experienced programmer. And the good friend and another colleague created it. And that’s how Yucky Math was made. However, Apple had other ideas about the original concept and the name. Therefore, after many many revisions the app is finally in the App store under the name Yucky Math. All of our kids were heavily involved in testing the app, giving us feedback on the question difficulty coming up with new sound ideas, and approving and disapproving new possible sounds for the app. Kids of all ages (especially Elementary school aged), or anyone who thinks they are good at math and want to prove their skills.